Carl S. Glavinovich (left) and Walter A. Glavinovich (right), both undated. Photo from the Glavinovich family collection. Collectively, brothers Carl S. and Walter A. Glavinovich devoted more than one hundred years of their lives to the prospecting, deciphering, drilling, thawing, and mining of the Nome, Alaska, gold fields. Most of those years were in the service of one company, the U.S. Smelting, Refining, and Mining Company (USSR&M). Carl and Walter were at Nome during its start-up period from the late 1920s through the early 1930s, then throughout its hey-day, when multiple dredges profitably mined more than 30,000 cubic yards of material every day. Their stay extended into the difficult period of operation after World War II, when escalating mining costs and a fixed price of gold finally caused the Nome dredges to stop operations in 1963. It was never easy. Dredges burned or sank, the season was too dry or too wet, evaluation of the richness of placer ground was almost as much an art as it was a science, and pennies made a difference. Carl and Walter Glavinovich, neither of whom had college degrees in engineering as did many company managers, gradually moved up within the company. They learned every skill by doing, and their hard work, innovation, mechanical abilities, analytical minds, and years of experience were recognized when USSR&M put them in charge of its Nome and other property operations in the post World War II years. The brothers faced the difficult task of operating the mines profitably during an inflationary period that saw a fixed price for their product, placer gold, and they did it very well. Carl Stephen Glavinovich was born on July 1, 1906 in Split, Yugoslavia, to Roman Catholic parents Paul and Matija Glavinovich. Split, also called Spalato for its Italian name, is the major seaport of Croatia (Yugoslavia). It was a common point of departure to the New World in the early part of the Twentieth Century. Carl's brother, Walter, was born in Split three years later on August 2, 1909. In 1910, the Glavinovich family immigrated to the Unites States, settling in the Pacific Northwest. The two boys graduated from public high schools, and Carl was in attendance at the University of Washington in a pre-med program when he decided to try to earn enough money to pay for his education by working in Alaska. Carl went north in 1925, while Walter was still attending Ballard High School in Washington State. Carl enjoyed his Alaska experience enough to return to Nome in 1926, and a would-be doctor was converted to a life-long miner. After his high school graduation in 1927, Walter followed Carl to Nome to the same result: a lifetime in Alaska. Chronologically, the Glavinovich brothers fall in the middle of the mining history of the Nome district. In the fall of 1898, the Three Lucky Swedes, Lindeberg*, Brynteson*, and Lindblom* made the first critical placer gold discoveries in Anvil and Glacier Creeks. Although there was not enough valuable ground in those creeks to meet demand, the situation altered when gold was discovered in the beach sands that extended for miles along the coast. The beach discoveries resulted in Alaska's major gold stampede, from 1900 to 1902. The stampede made ordinary miners wealthy, but the shallow placer gold on the beaches was soon gone. The next discoveries were the richest yet; gold was discovered in ancient buried beaches. With the assistance of Charles Lane* and his Wild Goose Mining Company, Lindeberg and his partners organized the Pioneer Mining Company, and, over the next two decades, mined much of the remaining high grade buried beach sands with the aid of miles long water ditches (some engineered by James K. Davidson*), hydraulic giants, and gravel elevators. Around 1913, US Mining (which became USSR&M), a Boston-based company with hard-rock mines in western North America, began to consider dredge mining the remaining Seward Peninsula placer gold. The company learned that small dredges could dig shallow, thawed ground, but not the deep, frozen ground that contained the major gold reserves. USSR&M had no interest in small mines. During the late teen years of the century, a new process using cold water to thaw frozen ground was developed, and it appeared that mining in deep frozen ground could be profitable. America's "dredger king", Wendell P. Hammon*, decided to tackle Nome. In the mid 1920s, Hammon, with backing from USSR&M, installed two large dredges at Nome. Unfortunately, cold-water thawing, which worked on a small scale, was not effective in the deeply embedded frozen ground at Nome. Hammon had to call on USSR&M for assistance, which led to the reorganization of his own company, Hammon Consolidated Gold Fields, as a wholly owned subsidiary of USSR&M. USSR&M transferred an exceptional mining engineer, Roy Earling*, to Nome to take charge of its operations there. When Earling arrived in Nome, he found a former pre-med student, Carl Glavinovich, and his younger brother, Walter, ready to work on the thawing project. The Glavinoviches arrived in Nome during the time when cold-water thawing was being converted from a theoretical method to a practical mining method. Carl and Walter were innovative and hard working, and provided invaluable assistance to USSR&M engineers Roy Earling, Jim Crawford* (who arrived in Nome in May, 1929), and Jack Boswell*, in developing practical cold-water thawing techniques. The Glavinovich brothers were also adept at the evaluation of the gold content of dredge ground. Geologically, the recognition of fossil beaches and their complex relationships with alluvial deposits and with the great gold field where Anvil Creek flowed out from the mountains drew the interest of both Glavinovich brothers. Both men contributed their geologic knowledge to the classic study of the Nome placer deposits by J. B. Metcalfe and Ralph Tuck, and also to the studies of government scientists, especially David Hopkins, a geologist with the US Geological Survey, and John J. Mulligan, an engineer with the US Bureau of Mines. Carl and Walter spent hours discussing the origin of the placer gold fields with the trained scientists. Both men stepped into family life in Nome. Carl married Marguerite Johnson, but not before courting with a bang. Carl had to dynamite Marguerite's house to create a fire-break during a fire in which much of downtown Nome burned. Carl's reputation, well deserved, was that of a miner who sometimes worked around the clock, but he made time to assist in the revitalization of the Nome Kennel Club (NKC). The Club, at its strongest in the days of Iron Man Johnson and the annual races from Nome to Candle before World War I, was reorganized to aid the present day Iditarod race. Carl remembered that as a young man in 1925, he had been a member of the NKC when the Club gained worldwide fame on the Diphtheria serum run. "...where the quality of his produce was beyond belief." 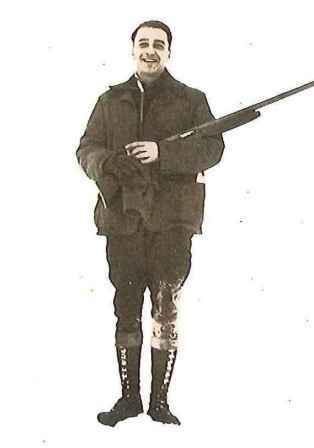 In 1928, USSR&M's engineer, Roy Earling, left Nome to accept a position as Manager of Operations of the Fairbanks Exploration Company (FE Company), the name under which USSRM & M operated in the Fairbanks area. Carl and Walter Glavinovich remained at Nome. Although there had been great practical difficulties in mining at Nome in the 1930s, economics improved for the Nome dredges after the 1934 increase in the price of gold. New dredges were added, and some years were very profitable. In 1935, the Glavinovich brothers had been given more responsibility, water for dredging was abundant, and the company put on a third dredge. Total production on the Seward Peninsula was over $1 million more than the preceding year. Another good year followed, when the dredges worked 186 consecutive days in 1936. Also in 1936, Hammon Consolidated Gold Fields, the wholly owned subsidiary of USSR&M, officially became the Nome Department of the United States Smelting, Refining, and Mining Company. Managing profitable and successful mines requires skills beyond the mechanical. 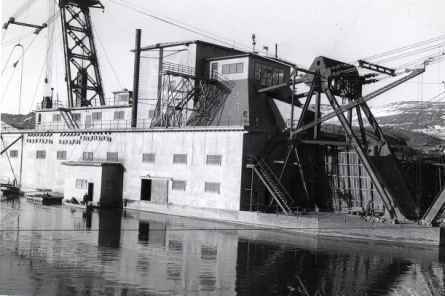 As World War II approached, staffing dredge crews became problematic. All positions: professionals, oilers, men on the thaw lines, became harder to fill. One solution that was adopted early-on at Nome was the training and employment of local Natives, who were promoted as their seemingly natural mechanical abilities were developed. Both Carl and Walter advocated employment of local Natives, and were more sympathetic than some Alaskan mining managers to subsistence needs. It was necessary to have some creative scheduling, but the result was often long-term employment. Conditions continued to worsen, however, with the impending war. Men had other employment options, and material shortages began to emerge. In 1942, most gold mining operations were closed by government order L-208. "Isn't it exciting to watch a settlement grow where once permafrost, polluted bogs and pesky insects once thrived [referring to the Fox area north of Fairbanks]." In 1952, there was a major shakeup at USSR&M's Alaska operations. Earling reached retirement age. Jim Crawford succeeded Earling, and became Vice-President of USSR&M and General Manager of all Alaska operations. Carl became Manager of Operations at Nome with Walter as his deputy. Walter also took much of the load in management of the outlying camps at Hogatza River in the Koyukuk region, and Chicken Creek in the Forty Mile district. Although economic conditions were difficult, another dredge was added to the Nome fleet, Dredge No. 6, which began to work the Submarine Bench where the good pay was below sea level. Dredge No. 6 was built from parts salvaged from Dredge No. 3, which capsized in its pond in 1953. In 1963, economics finally forced the Nome fleet to shut down. Dredge No. 6, circa 1990. Photo from the T.K. Bundtzen collection. The two smaller dredge operations on the other properties continued. From 1959 to 1967, more than $2 million in gold was dug from the small, high-grade placer deposit at Chicken, but under difficult conditions, ranging from damage to the dredge during startup operations to the loss of employees due to the recruitment of firefighting crews by the US Bureau of Land Management, which offered higher pay than the mining company could afford to. With the shut down of the Chicken Dredge in 1967, the only dredge left operating in Alaska was USSR&M's other small dredge at Hogatza River. Hogatza was entirely a post World War II operation, and had a large contingent of employees from local villages, such as Hughes. 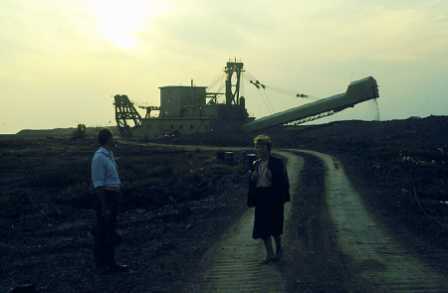 It was quite remote, which may have contributed to its successful operation, as there were few employment alternatives. The operations at Chicken and Hogatza were under the direct supervision of Walter Glavinovich. He provided some interesting comments on the movies that USSR&M chose to send to its remote camps for their crews entertainment. Westerns were preferred. Mysteries, musicals, and comedies were appreciated occasionally. But, as Walter put it, by no means send English films, ". . .as these are definitely not appreciated." Hogatza operated for USSR&M until 1976, and was back on line for other companies during, and after, the 1980s, when the price of gold escalated. Dredges No.5 and No. 6 in the Nome district were restarted in 1973 and worked until 1995. Carl and Walter Glavinovich maintained company operations at Nome as long as feasible. Carl retired in 1971, and mined successfully on Glacier and Anvil Creeks. His last clean up was from a pit only one-quarter of a mile from the original discovery on Anvil Creek. As Carl's son Paul remarks, "He just knew there was more gold there." He died, a respected man and miner, on May 4, 1980 in Anchorage, Alaska. Carl S. Glavinovich operating hydraulic equipment in the Nome district, with Anvil Mountain in the background, undated. In 1981, Walter was recognized by the School of Mineral Industry, University of Alaska, Fairbanks, with a Distinguished Service Award. The award was primarily for his contributions to dredge technology, especially thawing methods. 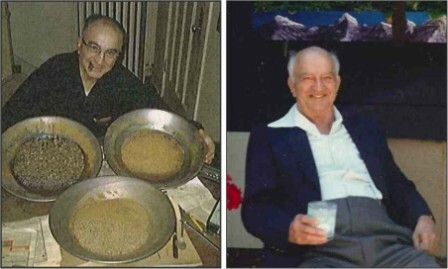 Walter Glavinovich died on September 6, 2002 in Washington State after a long period of gradually declining health. 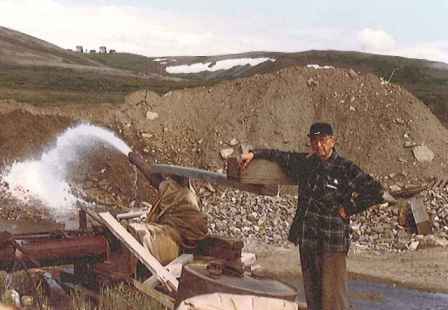 Carl and Walter Glavinovich were innovative and hard working, and with their assistance, USSR&M engineers were able to develop practical cold-water thawing techniques and successfully evaluate the gold content of dredge ground, which helped set the pattern for the economical mining of perennially frozen ground in northern Alaska for the next forty years. Cost effective cold-water thawing allowed the economic development of the major dredge fields at Nome and Fairbanks, Alaska. Nome and Fairbanks could have ended up as ghost towns; instead they prospered throughout the depression and beyond, and the Glavinoviches were part of the reason. Dredge No. 5 in operation on 3rd Beach, circa 1957. Dredge No. 5 was the largest on-land gold dredge ever to operate in Alaska. Mulligan, J. J., 1946, Heavy Metal Report-Alternative Thawing Methods: U.S. Bureau of Mines Open-File Report. Noyes, Leslie, M., 2001, Rock Poker and Pay Dirt: The History of Alaska's School of Mines and it's Successors: University of Alaska Foundation, 712 pages.